Despite the excitement when Webber Field was dedicated in Williams in 1925, the following years saw the deterioration of the airfield. Williams gained its first local pilot, Hubert A. Clark in the 1930s, but it wasn’t until 1939 with the Civilian Pilot Training Program, that Williams saw a resurgence of aviation interest in Williams. In 1934, D.D. Brimley, an assistant federal airport engineer, visited Williams as he inspected airport sites in northern Arizona. He reviewed a location three miles north of Williams that was selected as a possible airport location by Charles Lindbergh when he flew through the area in 1925. An application for Civil Works Administration funds was submitted in March 1934 and the airport site was selected for development. In July 1935, the first mobile unit of a federal transient camp rolled into Williams to begin construction of the airport. 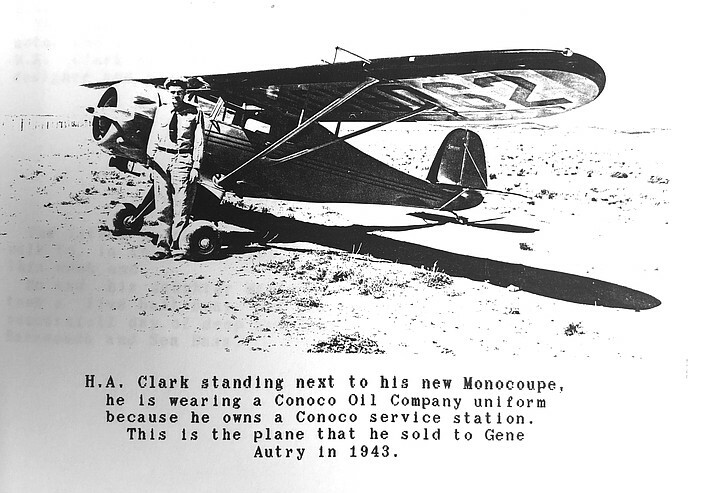 According to the June 17, 1937 edition of the Williams News, Clark was fascinated by airplanes and purchased a two passenger monocoupe plane from the Northeast that month and flew it through Denver to Phoenix where he received his student pilot’s license. The plane had a 75 H.P. Graham motor with a cruising speed of 120 mph. Clark planned to hanger his plane at Webber Field, but because of the roughness of the field he left it at Sky Harbor in Phoenix. In 1940, Williams Airport received $142,000 for airport improvement from the Civil Aeronautics Board. The following year, Clark created a local flying club and helped the group purchase a plane. The group used the field three miles north of Williams during the summer, but moved their plane to the new government airport in Valle in the winter. Clark routinely made headlines in the Williams News for his travels around the west in his plane. He would fly around Arizona and even occasionally flew to the California coast for deep sea fishing. Over the next year, the Williams Flying Club put in significant hours to upgrade the airport north of town and were rewarded when representatives from the federal government officially designated the field eligible for use by Army and Navy aviators in the fall of 1942. The city hoped the field would encourage the armed forces to train aviators at the field and began looking at ways to house and feed them. The field now had a hangar, office, runways and a telephone line. The government required a guard to be stationed at the field. A few months later, seven Army instructors began training 30 cadets at the airfield and Clark went to Wickenburg where he used his experience and plane to tow gliders who were training for the invasion of Europe. In April 1943, Clark made aviation headlines when he sold his monocoupe to country singer and actor Gene Autry. Unfortunately, as Clark was returning to Williams after purchasing a new plane in Texas, he was killed July 13, 1943 when his plane crashed eight miles west of Jacksonville, Texas. Because of Clark’s efforts in establishing a flying club in Williams and his significant work toward upgrading the Williams field for government approval, the city renamed the airport H.A. Clark Memorial Field.